Already a sensation in Europe, Spotify’s free music streaming service just landed in the U.S. today, and sure enough, it’s all over the news. So, what’s so special about Spotify? Aren’t there already music sites like Pandora and Slacker (more on them in a moment) that stream tunes to your PC for free? Well yes, but Spotify boasts a key twist that sets it apart. Launched back in 2008, Spotify is an online music streaming company that serves up more than 15 million songs from all the big music labels, which you play through a peppy, easy-to-use desktop application (similar to iTunes). Spotify has been up and running in seven countries—including the UK, Sweden, Finland, Norway, France, The Netherlands, and Spain for some time now, but it’s only making its (long-awaited) U.S. debut today. Spotify offers three membership levels: a free service that lets you play up to 20 hours of music a month (as noted by the New York Times) with occassional advertising, a $4.99-a-month Unlimited plan that lets you stream unlimited music, without the ads, and a $9.99 Premium service that offers downloadable or streaming music for your smartphone. OK, so what’s so special about that? Aren’t there already websites that stream music for free? Yes indeed. There’s Pandora, a popular music site that lets you create instant (and free) radio “stations” based on, say, your favorite artist or a particular song. Two other sites—Slacker, and Last.fm—do much the same thing. Meanwhile, we’ve also got Napster and Rhapsody, which offer for-pay streaming music starting at $5 and $10 a month, respectively. 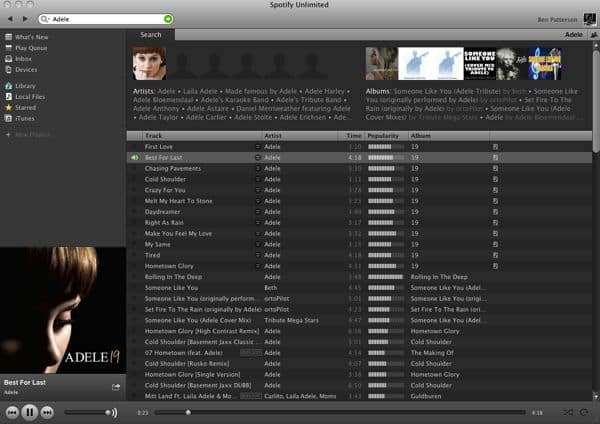 Spotify’s peppy, easy-to-use desktop software for the Mac. But here’s the thing: With Pandora, Slacker, and Last.fm, you can’t search for and play the exact song you want to hear (or at least you can’t with their free accounts). Instead, selecting, say, “Born in the U.S.A.” by Bruce Springsteen will queue up an instant “station” with similar songs—great if you’re simply in a Bruce kind of mood, not so great if you must hear “Born in the U.S.A.” in particular. With Spotify, you can choose and play an exact song with a free account—a key advantage over its free online music competitors. The catch? As I mentioned above, you’ll hear occasional advertisements between tracks, and you’re restricted to 20 hours of music streaming a month in the first six months of your membership. After six months, you can only listen to 10 hours a month. And one more thing: you aren’t allowed to listen to any particular song more than five times a month. But if you pay for a Spotify account, those limitations are lifted, right? Yep—starting with the $5/month Unlimited plan, you can listen to all the music you want, all the time. Yes. Spotify signed deals with all the big music lables, so don’t worry—you won’t get hit with any lawsuits or get in trouble for using Spotify on your work PC. Okie doke, you convinced me. Where can I sign up? Right here, but there’s another catch: For now, access to the free Spotify plan is by invitation only. You can sign up here to request an invite. That said, you can sign up for an Unlimited or Premium account immediately—and if you do, you’ll be granted two invites to share with your friends. Any other interesting features we should know about? Well, Spotify’s desktop software is actually pretty nice—clean, easy to use, and very fast (and streaming tracks on Spotify start playing instantly, by the way). You can also share any songs you’re listening to on Facebook or Twitter, and you can share (or not) your iTunes playlists with your Facebook friends. So, any other questions about Spotify? Let me know! Did you enjoy this post? Want more info? Please let me know your thoughts it on Facebook!